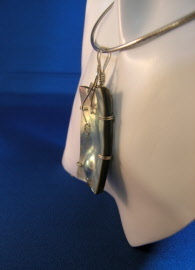 Abalone blister pearls can be natural or cultured. The pearl grows attached to the inner surface of the abalone. 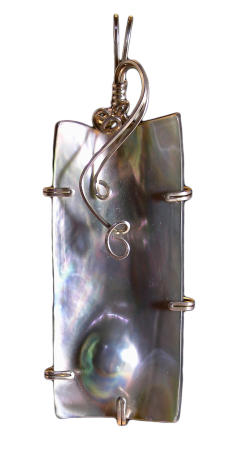 For this pendant, the shell of the abalone has been cut into a rectangular shape to include the blister pearl, measures 56 mm x 24 mm. 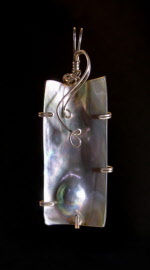 Shades of green, blue, pink, purple and silver can be seen as the pendant moves and light reflects off of its surface. Fine-quality abalone pearls have an almost metallic-like luster. Wrapped in argentium wire in a free-form prong setting. Finished size is 77 mm x 28 mm. Weight 0.6 oz.